Let’s start by saying there is nothing wrong with wanting to go see Vatican City or the Colosseum (They are, after all, stunning). Plus, you are likely mentally prepared for the lines and getting knocked in the head by selfie sticks. Although many famous sights are worth visiting, you don’t need to get ripped off by paying three-four times the standard rate because you wanted an English-speaking guide, only to find out that it’s already included in the general entrance fee. And no one should go home after a trip to Italy saying the food was just “OK” and over-priced because they only ate at restaurants where no self-respecting Italian would step into. Tourist traps can give a destination a bad rap and leave tourists feeling cheated. 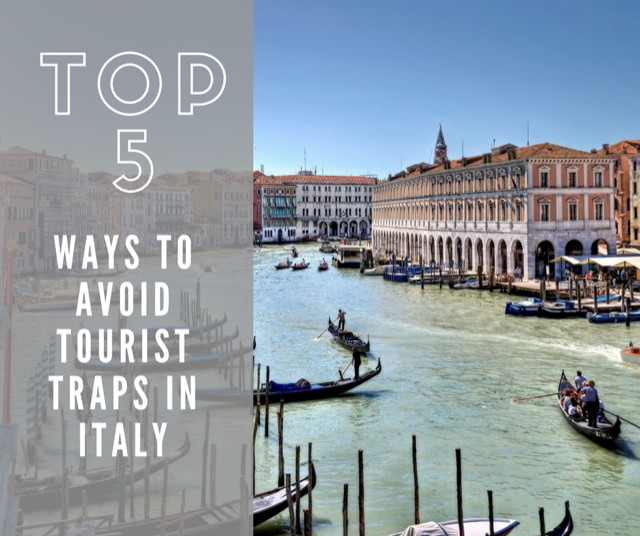 Fortunately, you don’t need to forego the top sites in Italy to avoid falling into tourist traps. Although you might think it’s hard to find bad food in Italy, it’s surprising how many subpar and overpriced restaurants you can find especially near major tourist sites. It’s tempting as a tourist to get lured into a restaurant with an English-speaking host and a menu with pictures so you can point. For those wanting to avoid tourist traps, you’re going to have to get outside of your comfort zone. To really get the best food in Italy, you need to try local restaurants, and you’re not going to get that at a restaurant with pictures on the menu. Think about restaurants in America with pictures of the food: TGIFridays, Chili’s, Outback Steakhouse, McDonalds. Can you imagine traveling all the way to Italy and eating at the Italian version of these restaurants? Especially since while those restaurants are cultural norms in the States, in Italy, they are not. There are very few restaurants where locals would actually eat with pictures on the menu except for places like you guessed it: McDonald’s and Burger King. In Italy, a star next to a menu item generally indicates that one or more ingredients in that dish started off frozen. And, it’s illegal for restaurants in Italy to serve frozen food and not report it as such. If a menu has more than five items that started frozen or if it just has a vague caption saying that some ingredients may be frozen without specifying which ones, then pick up and run in the other direction. It’s a trap. Most countries have some type of guide that serves as a reference point for food lovers and connoisseurs. In Italy, great reviews and ratings from Gambero Rosso are much like those from the esteemed Zagat in the States. Slow Food, on the other hand, is an association that promotes agricultural biodiversity and traditional local cooking. A restaurant or a purveyor featured in one of their guides will have to adhere to those principles. And who doesn’t like that when traveling abroad? The Michelin guide is always an excellent resource for finding a top-notch meal. What you may not know is that in addition to their top-rated “starred” AKA expensive restaurants, they also include reviews for places that won’t cost you a fortune. Gambero Rosso, Slow Food, and the Michelin Guide all provide stickers to their top-rated food establishments. Many restaurants happily stick them on their doors and windows as a testament to a job well done. Just make sure the stickers are recent. If the newest one is from over five years ago, the chef or owners may have changed, and their commitment to excellent food may have left with them. Obviously don’t wander around at night by yourself, and always be vigilant about safety but during the light of day, see what you can find just by walking around. If someone tries to push you into their store, politely decline and find those cute boutiques, those local restaurants, and the parks and churches that aren’t listed in Frommers or whatever tour book or website you consulted. If you found the sights fast online, then so has all the other travelers searching for things to do in Italy. When you stumble upon a blog, check out the website to figure out what you’re reading. Try to find blogs from people who have traveled extensively or people who are living in a foreign city. There are plenty of wanderers, ex-pats, and locals blogging about their lives and experiences. Be wary of the source of your information. If you find a blog you like, ask questions or make comments. Start a discussion and you can find others who have toured Italy and want to share their experiences. Many of these blogs offer just as many “don’ts” as “dos” so you can learn from other’s mistakes. If you want a genuinely authentic experience in Italy, that’s what Doing Italy does best. We guide you to see the best of Italy through the eyes of a local. If you haven’t planned a trip yet, check out our page of authentic local tours to Abruzzo and to Milan + Lake Como. If you already have your trip planned, don’t hesitate to ask questions in the comment box below!